Trastevere. tras-TE’-ve-re. ‘Across the Fiume Tevere’—or as we know it, the Tiber River. 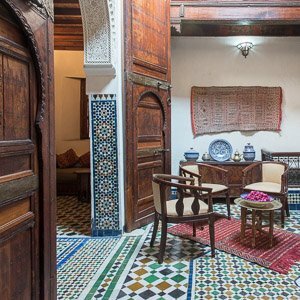 Stay in this shabby-chic, former working-class neighborhood and soak up the cobblestoned atmosphere. 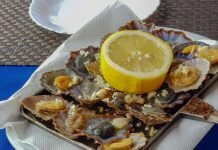 Walk its streets on a food tour with The Roman Guy and feel like a local! 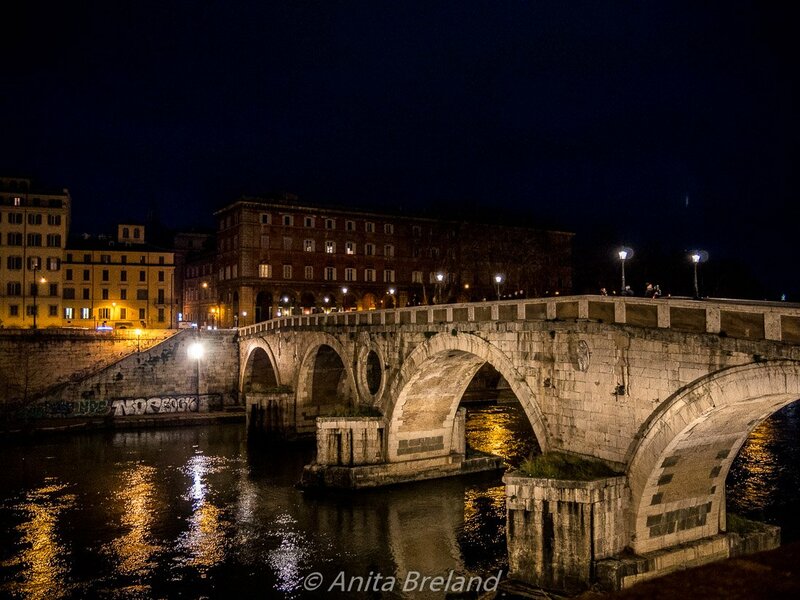 You’ll have several river crossings on the tour, including one over the Ponte Sisto, a pedestrian bridge built in 1475 by Baccio Pontelli, who designed the Sistine Chapel. 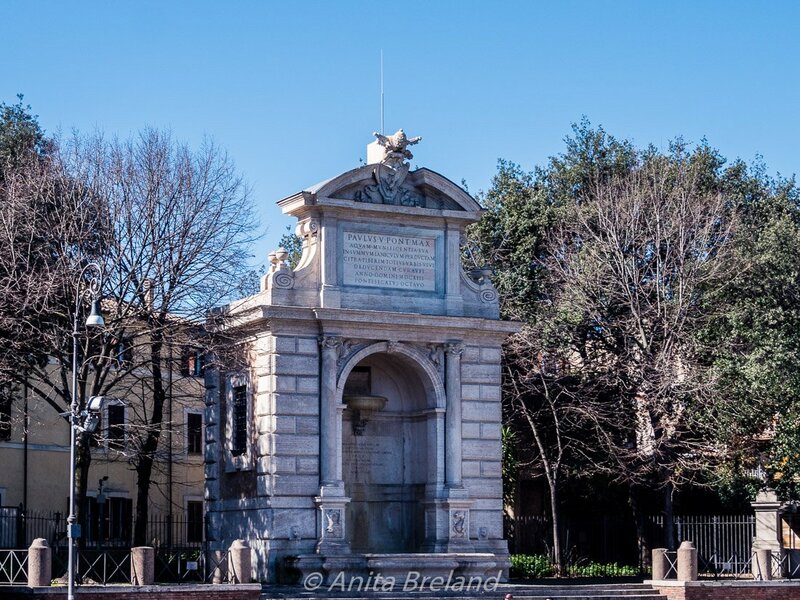 It is the elegant entry point into Trastevere’s Piazza Trilussa and a marvelous place to practice the exquisite ritual of passeggiata or evening stroll. Given the luxury of time to plant ourselves in one spot for a week or two, Tom and I like to rent an apartment, settle in and wander around with cameras and appetites at the ready. 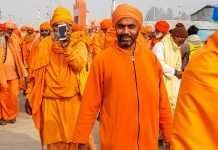 The real fun begins, though, when we set out on a food walk with someone who really knows the area, loves the food and loves to share their enthusiasm with traveling foodies. Last month in Rome, we turned to The Roman Guy to show us around. Our guide Fiona brought her decades-long connection to the city to our tour, along with a trove of Roman family stories and plenty of local knowledge of the city’s foodways and cultural traditions. Her enthusiasm was infectious and our little group was soon chatting among ourselves as we went from cheese shop to wine bar to gelato stand. In general, Tom and I found it a bit difficult to get our bearings in Trastevere, what with all the twisty streets that seemed to move their dead ends from one day to the next. Our walk with Fiona gave us several reference points that proved quite helpful for the rest of our stay. 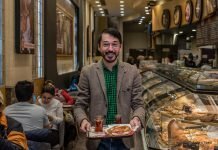 Italians take great pride in their food and The Roman Guy’s tour is all about Roman food and the city around it. 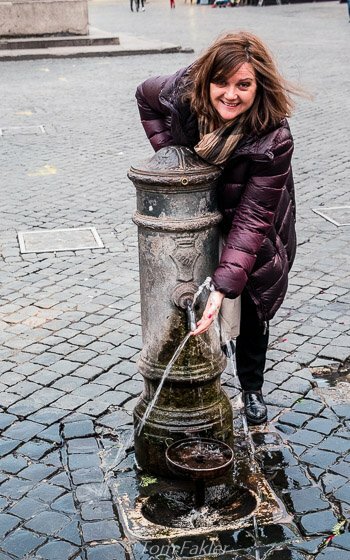 Our walk featured food that was organic, seasonal and locally sourced, sampled in the historical surroundings of three foodie neighborhoods: Campo Fiori, Trastevere, and the Jewish Ghetto of Rome. We met other tour participants at Piazza Farnese and headed to Campo de’ Fiori, a local marketplace for the past 400 years or so. We visited the piazza at dusk, long after the bustle of the daily market had ended and before the nightlife of young Romans kicked in. 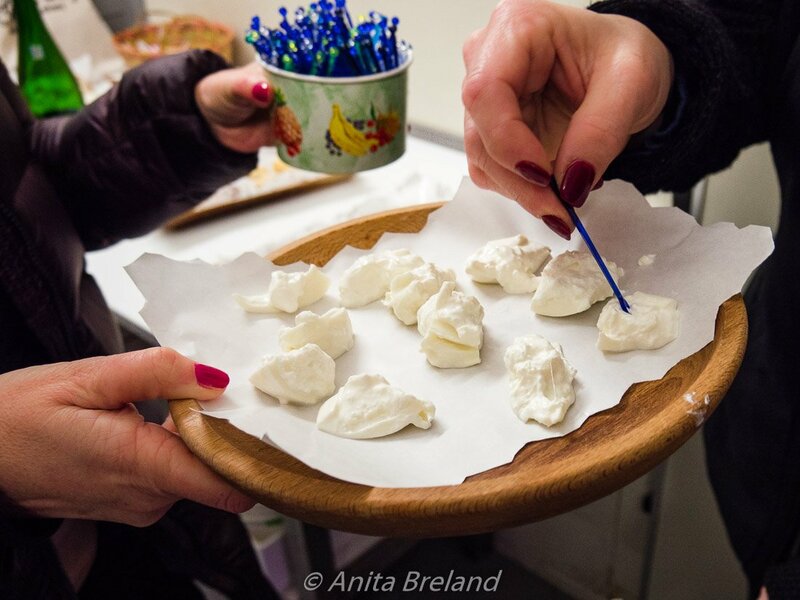 Our tastings began in this neighborhood with an array of cheeses and a glass of Prosecco at a nearby cheese shop. We walked streets named for trades, such as crossbow-making (Via dei Balestrari)and tailoring (Via dei Giubbonari) and watched a glorious sunset before crossing the Tiber via the Ponte Sisto into Trastevere. Our tour with The Roman Guy began at Piazza Farnese. 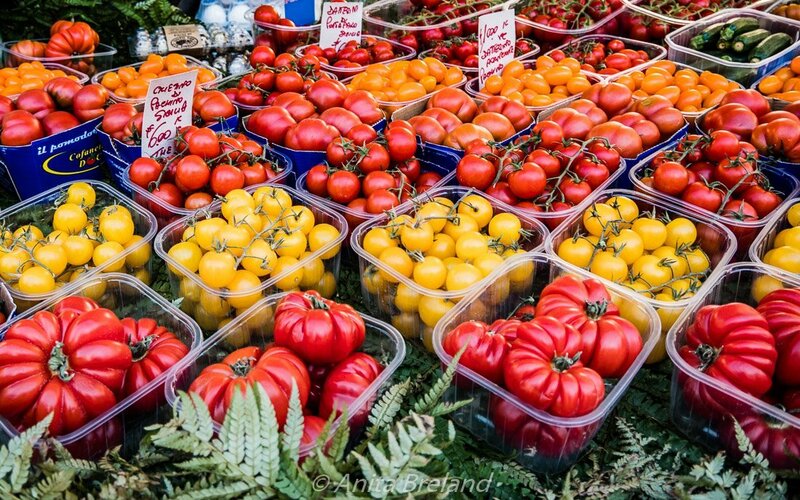 Beautifully displayed produce at Campo Fiori’s daily market. 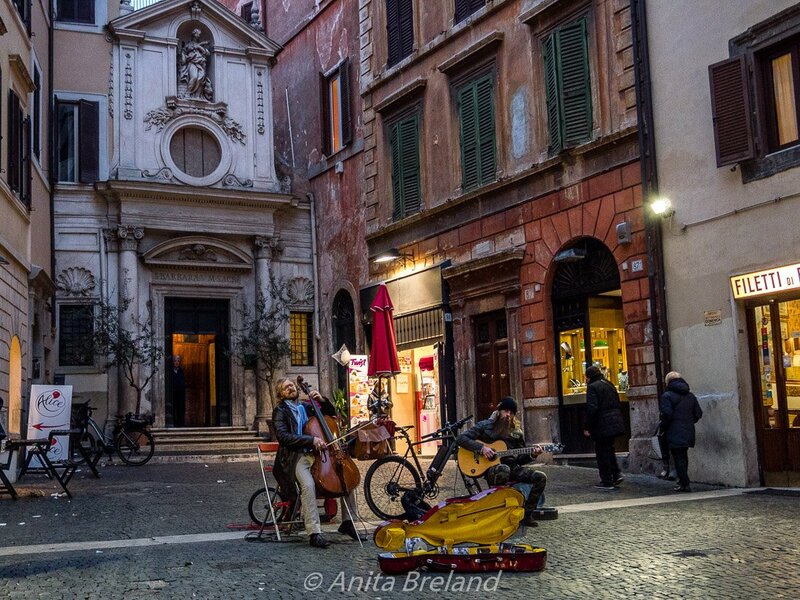 Cellist Fabio Cavaggion entertains passersby along Via dei Giubonari, not far from Campo de’ Fiori. Our progressive aperitivo continued in Trastevere with pizza slices and, at a tiny place in the heart of the neighborhood, cheese drizzled with chestnut honey, bruschetta topped with carrot and radicchio spreads, and organic wine (Here’s what Wandering Italy—an award-winning source of great Italian food lore–says about farm-to-table dining at this Trastevere hole-in-the-wall). After a wander through lively streets past diners sitting outdoors under heat lamps, we stopped in a trattoria for Roman-Jewish style artichokes and two pasta classics before heading back across the river via the Tiberine Island. Pizza al taglio, the original Italian fast food. Pastel buildings line the shaded, cobblestone streets of Rome’s Trastevere neighborhood. 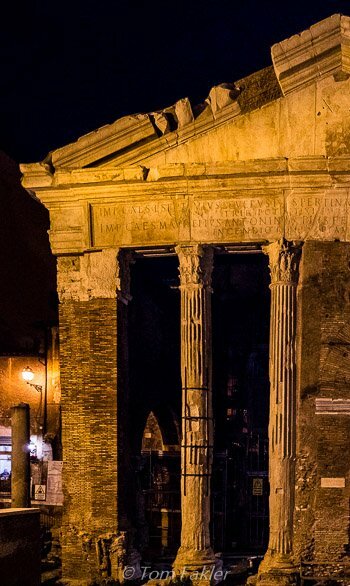 The Great Synagogue of Rome, grandly lit against a nighttime sky, welcomed us to the Jewish Ghetto of Rome, a neighborhood in Rome’s Sant’Angelo district since it was established by papal decree in the 16th century. Over the centuries, its residents experienced discrimination and lived in extreme poverty. Today, the area is a neighborhood of restaurants, a bustling quarter that is also a culinary destination. Its historical monuments showcase Jewish culture as well as Roman architectural grandeur. The Synagogue stands on space cleared when most of the ghetto was demolished after 1870, its distinctive dome visible from all over Rome. The 2nd-century Portico d’Ottavia was the site of a fish market in the middle ages. Our glimpse during the food tour was just enough to lure me back for another look. Our introduction to Roman food concluded with a final stop, for generously scooped mounds of organic gelato…Ahhh. Mine was a pure chocolate and ginger combo, a fine way to end our walk. 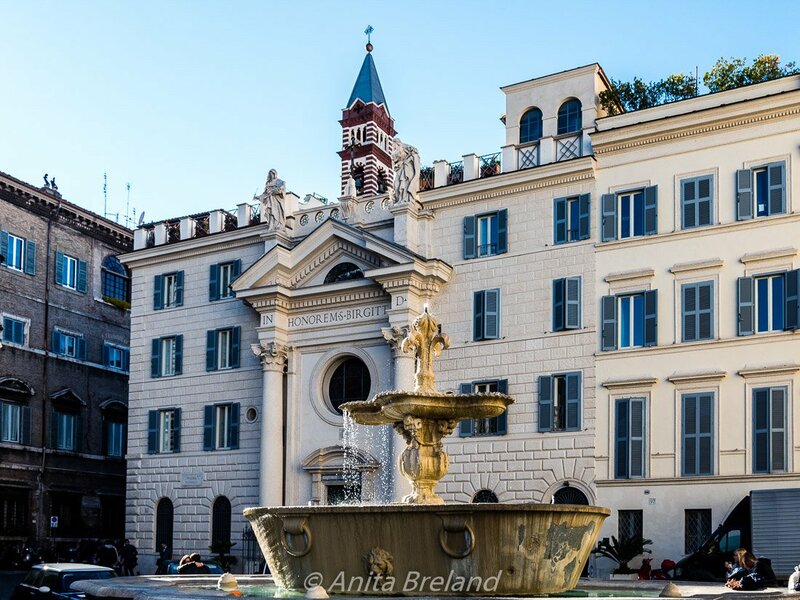 Wedged between the Tiber river, the Vatican, and Janiculum Hill, Trastevere is one of Rome’s most typical quarters. 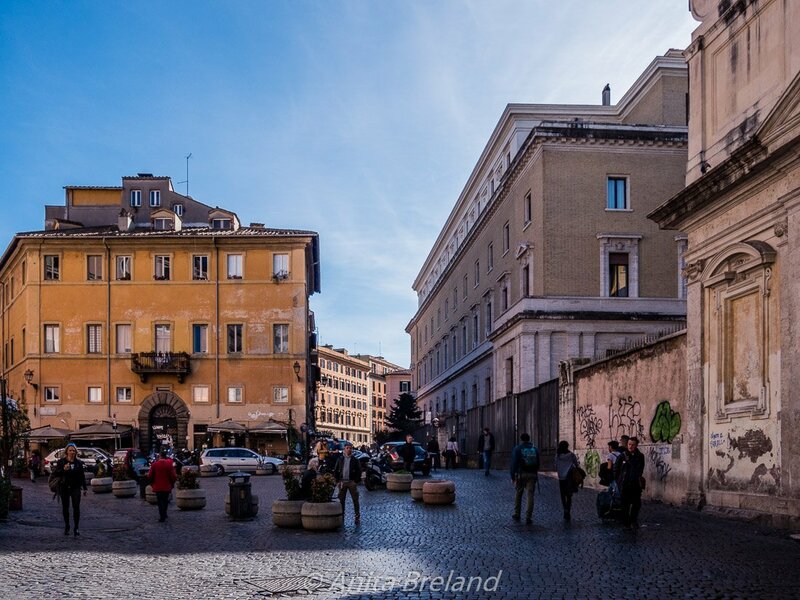 Its myriad bars and restaurants attract locals and tourists alike, and it is certainly a place for a visitor to enjoy the good life while in Rome. 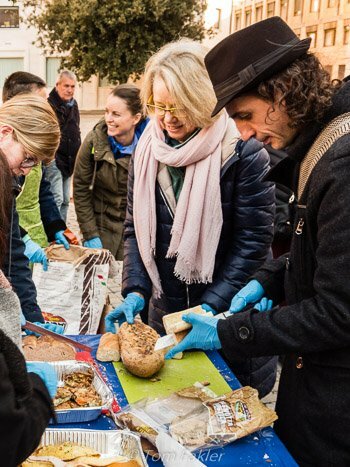 But Piazza Mastai in Trastevere is also the venue for a feast of another kind: weekly breakfast service to disadvantaged people living on the streets of Rome. The event is coordinated by La Ronda Roma NGO (Art and Social Solidarity). Volunteers can register via the group’s website or the ROMAltruista web portal. 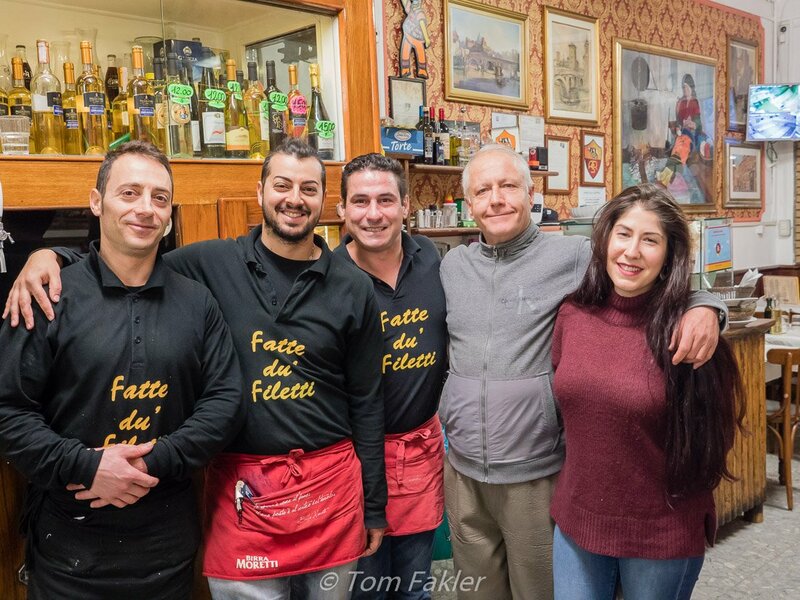 The staff of The Roman Guy regularly participate in the breakfast service and invited Tom and me to come along with them while we were in Rome. The bread and much of the food was donated by local businesses and supplemented by contributions from volunteers. We joined students from John Cabot University and other helpers, making sandwiches and handing out coffee, milk, cornetti and pizza slices. It was an hour well spent! Thanks to The Roman Guy for inviting us to join the Trastevere “Locals” Food Tour and learn more about Roman food traditions during our stay. We loved every tasty bite! Definitely going to look up these foodie places the next time I go to Rome! Thanks for taking us on this tasty food tour with you! The Roman Guy and his guides sure sound as though they know their food. 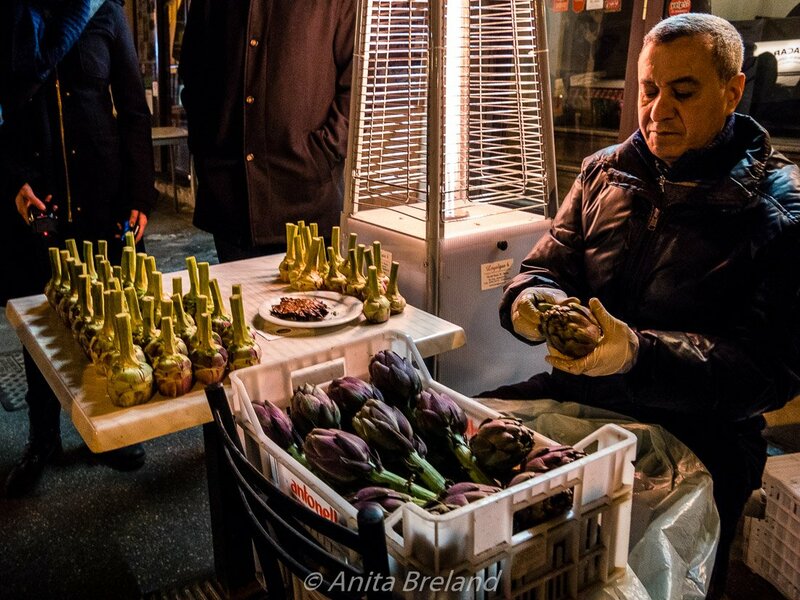 I too ate Roman-Jewish style artichokes in Trastavere and loved them. 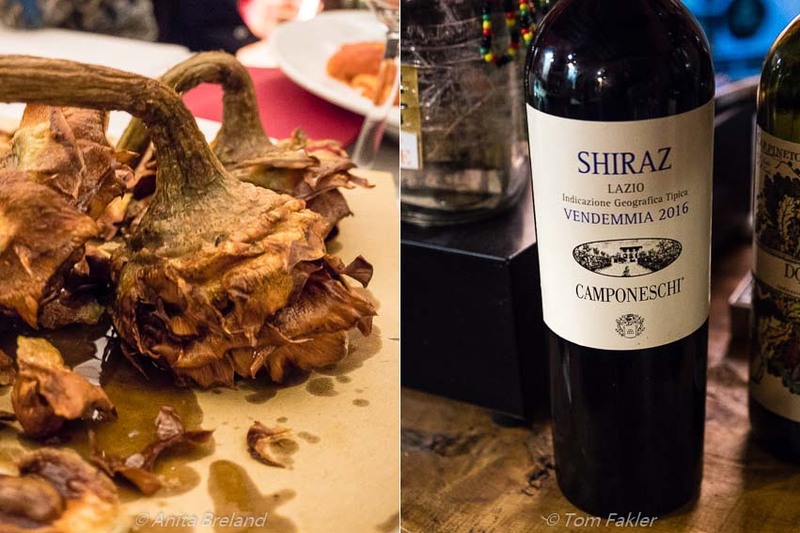 The seasonality of the tour was great…artichokes just one of the many ways we felt The Roman Guy hit the mark! What a lovely idea about giving back via the breakfast service. 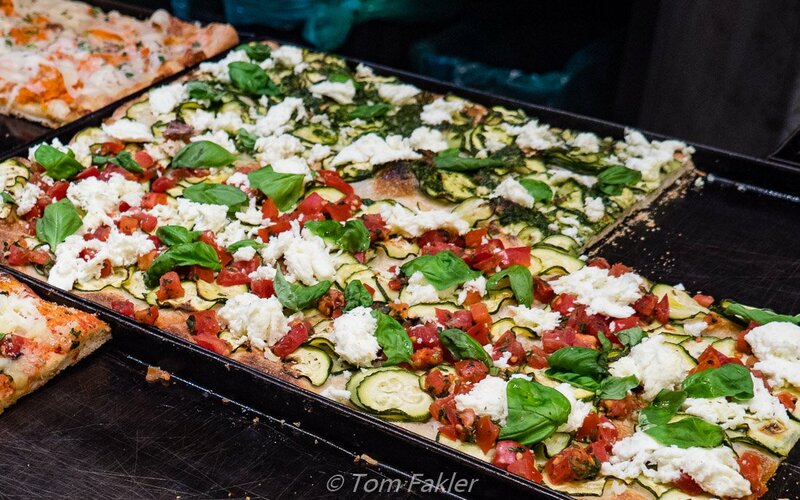 The food, of course, looks amazing….especially the Pizza al taglio. It looks SO fresh! 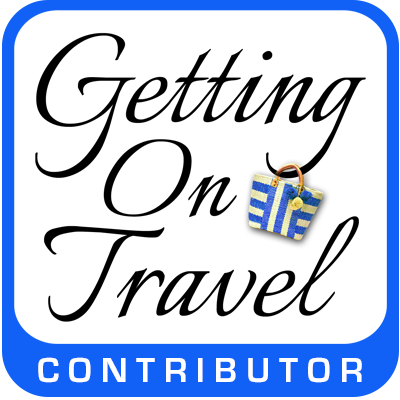 Tours that tie in some history, great food, and sites are perfect ways to see a city. Looks like you had a perfect time! I was quite impressed with all aspects of The Roman Guy’s offerings and community engagement. It was heartening to learn of their involvement with local charities, and of course, to take part. All round, a marvelous food travel experience! I stayed in Trastevere just before Christmas and had a wonderful time (both the food and the place)! Hoping to get back before long. As you can tell, we enjoyed the food, too! Wonderful vibe there, I agree. 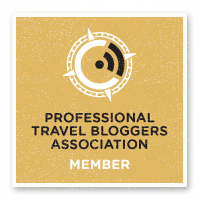 Wow…I just had dinner and I could eat again…what a great visual foodie tour!! Thank you, Marilyn! What’s not to like about Italian food, right? !